In preparing this article, I was a bit startled to learn of the extensive and massive powers that government already possesses to quarantine people under the guise of protecting public health. It’s pretty frightening if you think about it. Here is a complete list of what they can do anytime. I suspect that the actual way this plays itself out is that people generally trust government to protect us. It fails. People scream. Government goes overboard and violates everyone’s rights and uses its power for political reasons. It’s the old story, in other words. Of course it does. None of this should be startling or shocking. They proved where the limits to their powers stood many decades ago when the Japanese were rounded up and put in camps. Its not about laws its about what private solution has been disallowed. Quarantine is quarantine regardless of who does it. Its as Old as the Laws of Moses and Unchanged from that day. Suitport space rover or biohazard unit. Medical staff are catching the disease while desuiting or cleaning the suit for the next user. 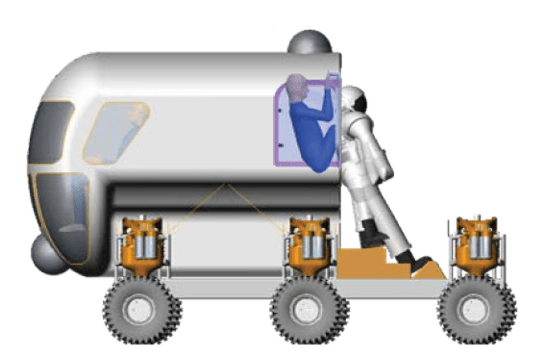 We need a suit that you climb into from the back and never leaves the contaminated space. We need 10000 of these in Biohazard configuration: http://en.wikipedia.org/wiki/Suitport There is One at AMES lab mounted on a truck (gathering dust in California I suspect.) We need them in the next 90 days. We need them configured with built in air conditioning for the tropics and all at a price that a bankrupt third world country can afford! Can the free market do this. The relevant laws in Australia date form Federation. There is simply no other way! I get endlessly frustrated at libertarians rubbishing the way government does things without proposing an alternative or acknowledging that in a libertarian or anarchist society it would be exactly the same. Some of us debated this years ago in the context of writing a libertarian constitution. In a free market system where there are no public property then contagious disease carriers would be Quarantined by private property owners simply defining them as trespassers. Where would the person be ejected to if there are no public spaces including public hospitals? How would they be ejected; sniper rifles would trump handcuffs when fear takes hold in the heart of the average private landowner or security man. Its an undeniable self defence situation. Would private hospitals foot such a bill knowing the carrier is probably not financial or would be quickly bankrupted by the situation? With no public roads there is a second question. Would road owners allow a carrier even in a private ambulance be allowed to go through? Given the transport problems that creates it would be a death warrant for anyone trapped at home with a disease. A polycentric law system would need an expedient, 2 – 4 hour, way to resolve disputes about transport to care. If a person dies because transport to care is blocked by road owners and others then the court resolution defines the precedent for all subsequent cases. Monocentric law is created by such precedents when all agree that only one solution works. Would a non government CDC equivalent have the recognised authority, funding and resources to fight the disease? Would several co-ordinate better than the current system? If someone is placed in Quarantine do they get adequately fed? Do they lose their job? Do they suffer 28 days of mind numbing boredom like someone locked into solitary confinement? These are the problems in West Africa already. Who compensates them for the personal costs to life, career, etc? Quarantine can be freely entered, the women that was reported from Cairns Queensland Australia is back into self quarantine after being cleared in Hospital because the test only check if she has the damage done by the virus, there is no test for the virus itself yet. A Government facility is working on that 7 km from me right now. She is an expert in the field. She passed through 5 airports because there is no other way to get from West Africa to Cairns and she could not say for many reasons. However for most people quarantine is, and must be, coercive. There is no technological or social alternative. It is an interruption to their lives. It is an essential interruption to their liberty even if after 14 or 28 days even if they prove to have never had the virus. There are people working on solutions in the free market. Rather than criticising government we should be searching them out, publicising them and funding them. We could create a crowd funded NGO to pay people to go into quarantine and pay employers to keep their job available. How much would you demand to be locked in your home or a hospital for almost a month with on income? We should throw together a crowd funding campaign for deployable suitports, High powered UV C lamp kits, quarantine compatible delivery and cleaning robots. Maybe even teleoperated robot nurses for hospitals. Saying “I don’t like how governments do things” without defining how the free market would do it differently is fruitless. I can also guarantee that as soon as you define an alternative solution your government will grab it thankfully. So how would the free market, and NGO’s like the Red Cross do things different? Look ma no gloves. Red Cross at the Duncan Family quarantine. Its not about laws its about what private solution has been disallowed. Or is the only libertarian solution most people know of the weapons in Day Z. Yes, Wesley, quarantine must be coercive. If Ebola, or something else, ever meets the level of the fear of pandemic, quarantine will demonstrate a serious test of libertarian thinking. Your solution involving crowdfunding should be promoted. If everyone who is sitting in front of their televisions with fear in their heart would just donate the price of a cup of coffee, there would be enough funding to get started on your suggestions.